Image: "In the Wilderness Prepare the Way,"
Illustrated (NRSV) readings from Vanderbilt Divinity Library. The only film that enlarges on the relationship of Jesus and John the Baptist is 1999’s Jesus in which the cousins sit around a campfire and talk about their first visit to Jerusalem when they were 12. Preaching This Week, WorkingPreacher.org, Luther Seminary, 2014. 2011. 2008. "The Beginning of the Gospel," D. Mark Davis, Left Behind and Loving It, 2014. Preaching Helps and Worship Resources, Rev. Dawn Chesser, Taylor Burton-Edwards, Dean McIntyre, Prayers, Lectionary Hymns, United Methodist Church General Board of Discipleship, 2017. "Sermon Seeds," Kathryn Matthews, UCC, 2017. Commentary and Spiritual Perspectives. Commentary, historical background, poems and readings. Center for Liturgy, St Louis University. Español. Evangelectionary, R Wayne Calhoun, Evangelism Connections, 2014. Points for Teaching and Preaching, The Lectionary Lab, 2014. 2011. The Advenurous Lectionary, Bruce Epperly, Living a Holy Adventure, 2014. Disclosing New Worlds, Advent 2B, commentary and reflections, Lawrence Moore, 2014. Girardian Reflections on the Lectionary, Advent 2, by Paul Nuechterlein & Friends. Jesus Now, Advent 2B, lectionary, study and worship resources from Faith Futures Jesus Then & Now. Rumors, for December 7, 2008, Ralph Milton, "Sermon helps for preachers with a sense of humor." "In the Meantime," Melissa Bane Sevier, Contemplative Viewfinder, 2017. "Dreaming the Road," Jan Richardson, The Advent Door, 2017. "Prepare, Reorder, and Prioritize!" Sharron Blezard, Stewardship of Life, 2017. "The Angel in Camel Skin," "No More Lying about Mary," Nancy Rockwell, The Bite in the Apple, 2017. "The Politics of the Day of the Lord," Alastair Roberts, Political Theology Today, 2017. "Just the Beginning," David Lose, ....in the meantime, 2017. "Preparing the Way..." Janet H. Hunt, Dancing with the Word, 2017. "A Weirdo Appears in the Desert," Jerrod Mc Cormack, Modern Metanoia, 2017. "Time and Mortality," Jennifer Morrow, Ekklesia Project, 2017. "Ta-da! A Proclamation!" Glenn Monson, Law & Gospel Everywhere, 2017. "Life Goes On," Andrew Prior, 2017. RevGalBlogPals, commentary and discussion, 2017. Saturday Night Preachers Party. "Active Waiting," David Lose, ...in the meantime, 2014. "A Truth-Telling Advent," Karoline Lewis, Dear Working Preacher, 2014. Prepare the Way Edition, Revised Common Lectionary commentary and discussion, RevGalBlogPals, 2014. "The Nativity of Camel Hair and Death by Submersion," Question the Text, 2014. The Unbreakable Love of YHWH," John C. Holbert, Opening the Old Testament, 2014. 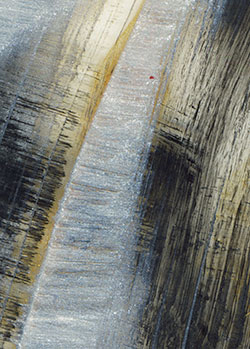 "Prepared with Water and Spirit," Bob Cornwall, Ponderings on a Faith Journey, 2014. "Mark 1:1 and 'The Price Is Right," Peter Lockhart, A Different Heresy, 2014. "People Look East," Katie Munnik, Presbyterian Record, 2014. "Stewards of Advent Time: Prepare," Sharron R. Blezard, Stewardship of Life, 2014. 2011. "The Kingdom? Here?" Beth Scibienski, 2014. "Take Comfort," Mark Ryan, Ekklesia Project, 2014. "Wild Man John," Michael Coffey, 2014. "Cousins and Opposites," Lynn Miller, Art & Faith Matters, celebrating our creative and living God by generating art and architecture resources for congregations and individuals. Art and Faith Matters facebook page contains additional resources. Reflections on collect prayers, Advent 2, Bosco Peters, Liturgy: Worship that Works - Spirituality that Connects. "Change Your Mind," Bob Stuhlmann, Stories from a Priestly Life, 2014. "At the Edge," Andrew King, A Poetic Kind of Place, 2014. "Let the gospel make its mark," Andrew Prior, 2014. Lectionary Notes for Advent 2, Beth Quick, 2014. "Making Straight Paths for the Messiah," Steve Godfrey, Church in the World, 2014. Lectionary Ruminations, John Edward Harris, Summit to Shore, 2014. 2011. "Divine Road Building..." Thomas Beam, 2014. "Visions from the Catacombs," Catacomb Churches, December 7, 2014. "I Want to Be Ready," Steve Goodier, Life Support System, 2014. "Just the Beginning," David Lose, Dear Working Preacher, 2011. "God Barges into Our Lives," Michael Joseph Brown, ON Scripture, 2011. Advent 2: Blessing the Way, Jan Richardson, The Advent Door, 2011. Use of images. "A Way in the Wilderness," Suzanne Guthrie, Soulwork toward Sunday: At the Edge of the Enclosure, 2011. Sermon Notes for December 4, Michael Rich, In-Formatio, 2011. "Channeling God," Peter Woods, I Am Listening, 2011. "Going round and round," "Flinging not furrowed," Fr. Rick Morley, a garden path, 2011. "Look At Me! World AIDS Day, 2011," The Journey with Jesus: Notes to Myself, Daniel B. Clendenin, Journey with Jesus Foundation, 2011. 2008. "Change Your Hearts and Lives!" Robert Cornwall, Ponderings on a Faith Journey, 2011. "What Are We Waiting For?" David Henson, Patheos, 2011. "Turnaround," Alyce M. McKenzie, Edgy Exegesis, Patheos, 2011. "Leftovers," Melissa Bane Sevier, Contemplative Viewfinder, 2011. "Filling in the Gaps," Neil Chappell, a weird thing, 2011. Dylan's Lectionary Blog, Advent 2B, 2005. Biblical Scholar Sarah Dylan Breuer looks at readings for the coming Sunday in the lectionary of the Episcopal Church, 2005. "The Church (Not) in Exile," by Sue Eaves, "A Harsh Voice of Comfort." A Sermon for Every Sunday. Video sermons from America’s best preachers for every Sunday of the Liturgical Year. "Beginning before it Begins," the Rev. Brian Cole, Day 1, 2014. "Finding comfort vs. being comfortable," Rev. Dr. Susanna Metz, Sermons that Work, Episcopal Digital Network, 2014. "The Kingdom of God," Frederick Buechner Sermon Illustrations. Ministry Matters, December 7, 2014. "Making Straight the Way," the Rev. Dr. Russell Levenson, Jr., Day 1, 2011. Selected Sermon, Advent 2B (RCL), Drs. Barbara Baumgarten and Cavid Catron, in Worship that Works, ECUSA, 2011. "Our Patience, God's Peace," the Rev. Dr. Kenneth Carter, Day 1, 2008. Bible Study, Advent 2A, 2014, Jessie Gutsgell, Sermons that Work, Episcopal Digital Network. "God's Way of Love Lasts Forever," Weekly Seeds, 2017. Lectionary Notes, Advent 2B, Rev. Beth Quick and the Lectionary Chat Group Bible Study of St. Paul's UMC, Oneida, NY. Life in Liturgy, Advent 2B, 2014. Mustard Seeds, "Preparing a Road in the Wilderness," Advent 2, 2014. A lectionary-based ideas resource for leaders of contemporary worship, Ann Scull, Gippsland, Australia. Lectionary Liturgies, Advent 2, Thom M. Shuman, Presbyterian Church (U.S.A.), 2014. Liturgy for the Celebration of Life, Advent 2B, 2008. Liturgies from a Progressive/Post-Liberal Theology, Revd Rex A.E. Hunt, The Uniting Church of St James Curtin, ACT. Worship and Liturgy Resources, Advent 2 by Rev David Beswick, Uniting Church in Australia. Lector's Notes, Advent 2, Gregory Warnusz, Saint Jerome Parish, Bellefontaine Neighbors, MO. Notes and commentary for those reading this week's lectionary texts to the congregation. Call to Worship, December 4, 2011, Mary Jane Konings, Timaru, New Zealand. The Timeless Psalms: Psalm 85:1-2, 8-13, (Advent 2B), Joan Stott, prayers and meditations based on lectionary Psalms, 2017. Wilderness God... -- Intercession by Janice Scott, The Village Shepherd. Prayers of the People, Advent 2B, Rick Morley, 2011. Prayer for Advent 2B, RevGalBlogPals, 2011. HermanoLeón Clipart, Advent 2, Free clipart, backgrounds, slides, etc. 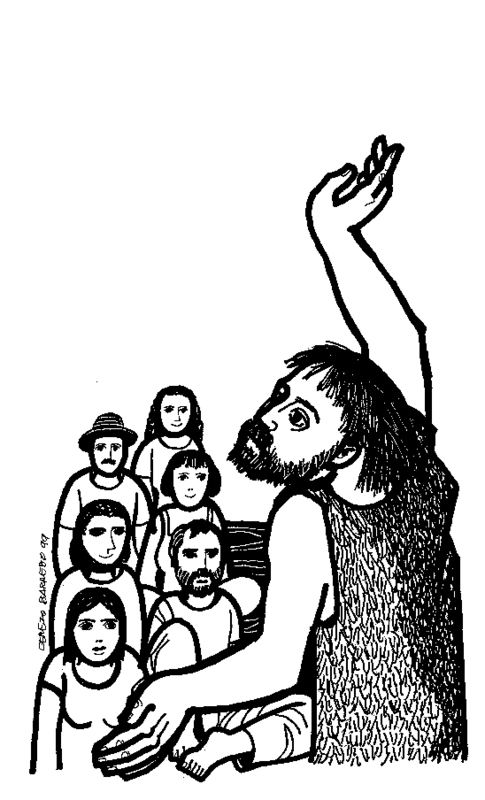 Clip Art Images: Mark 1:1-8, Misioneros Del Sagrado Corazón en el Perú. Advent 2B at Cerezo Barredo's weekly gospel illustration. Follows Latin American Roman Catholic gospel reading, though most gospels texts/themes are found in the index. Liberation emphasis. Scripture Pics, Weekly RCL-related image. "Level," John Stevens, Dollar Store Children's Sermons, Video, 2014. "Voices Crying Out: Comfort and Transformation in an Age of Mass Incarceration," David Garber, ON Scripture, Odyssey Networks, 2014. Video: "A Life Behind Bars: Transformation through Education." "People are like grass," David JM Coleman, youtube video rethinking Isaiah 40. "Soon the Lord Will Come," a song for Advent by Jeff Carter - words and music, 2014. “When John the Baptist Preached,” an original hymn by Carolyn Winfrey Gillette on John the Baptist. This hymn was commissioned by The Presbyterian Outlook magazine for new Advent hymns to Christmas carol tunes. Tune: VENITE ADOREMUS 10.10.10.10 with Refrain (“The Snow Lay on the Ground”). “Down by the Jordan,” an original hymn by Carolyn Winfrey Gillette on John the Baptist and Jesus’ baptism. This hymn is in the United Methodists’ Worship and Song (2011). Tune: LOBE DEN HERREN 14.14.4.7.8 (“Praise Ye the Lord, the Almighty”). “O God, We Hear Your Word of Grace,” an original hymn by Carolyn Winfrey Gillette on Psalm 85. This hymn was commissioned by The Presbyterian Outlook magazine for new Advent hymns to Christmas carol tunes. Tune: CAROL 8.6.8.6 D (“It Came Upon the Midnight Clear”). Hymn for Advent 2B to the tune "Rhosymedre", Paul Janssen, Pascack Reformed Church, Park Ridge, NJ. "Clear the Path," Brenton Prigge, NewHymn,. Hymns of the Spirit Three, Advent 2B, Richard E. Hurst, Universalist National Memorial Church. Hymn and Song Suggestions, Advent 2B, 2014, annotated suggestions from Natalie Sims, Singing from the Lectionary. Shepherd Sounds, Advent 2B, Background information for hymns and choral music following the lectionary from the Episcopal Church of the Good Shepherd, Austin, Texas, by Eric Mellenbruch and David Zersen. Lectionary Hymns, Advent 2B, National Association of Pastoral Musicians. Choral Anthem Project, Advent 2B, National Association of Pastoral Musicians. Worshiping with Children, Advent 2B, Including children in the congregation's worship, using the Revised Common Lectionary, Carolyn C. Brown, 2014. 2011. "Storypath Lectionary Links: Connecting Children's Literature with our Faith Story,". Children's Sermon, Faith formation Journeys, 2014.2011. "Preparation," Dianne Deming, Children's Sermons Today, 2011. A Daze Of Days, Wesley T. Runk, SermonStudio. A Little Song of St. Nicholas, good with Children's Sermons near Dec. 6), The Rev. Thomas L. Weitzel, ELCA.